German Chancellor Merkel and President Rivlin meet, discuss cooperation on regional issues and defeating ISIS. 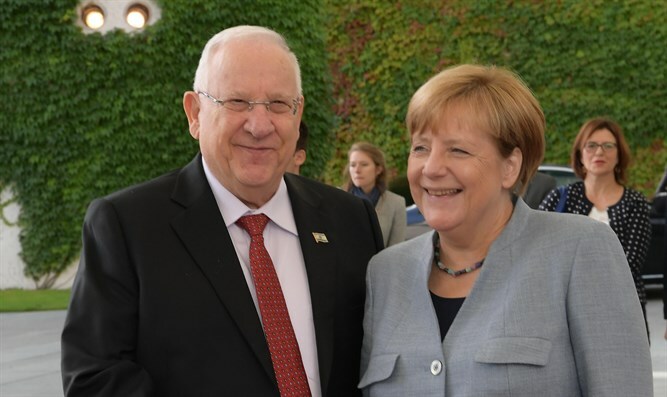 Israeli President Reuven Rivlin on Thursday held a work meeting with German Chancellor Angela Merkel. During their meeting, Rivlin expressed thanks and appreciation for Germany's deep commitment to Israel's security and identity as a Jewish and democratic state. "We all hope that the commitment between our countries will last forever, regardless of which coalitions rule in either country," Rivlin said. Rivlin also expressed Israels willingness to cooperate with and help Germany on all matters of mutual interest, and emphasized the importance of ensuring Israel's security despite regional instability. Thanking Merkel for her continued commitment to Israel and her support for the submarine deal, Rivlin said that Iran is working to create a Shiite continuum in the Middle East, posing a direct threat to Israel's safety. Iran's actions, Rivlin said, "may cause the entire region to break out in a war." Rivlin also mentioned the humanitarian aid Israel provides to victims of Syria's civil war - despite the fact that Syria is an enemy country. Hezbollah is an Iranian-backed terror organization based in Lebanon which endangers the local populace, he said. Explaining that the terror organization regularly violates UN Security Council resolutions, Rivlin noted that Hezbollah's weapons infrastructure will force Israel to respond. Merkel and Rivlin also spoke about global jihad and the threat presented by ISIS. According to Rivlin, "the global goal of defeating ISIS is important and justified." "Israel will provide all aid possible in order to achieve this goal," he promised. The meeting concluded with a discussion regarding the countries' bilateral relationship and the need to continue building the relationship in the future. Both sides recognize the importance of their relationship, and of ensuring cooperation on a wide variety of issues.